FMSC is a Christian nonprofit organization. We believe Jesus Christ has called us to feed the hungry and serve those in need. We strive to follow his calling every day in all that we do. In 2003, 16 years after FMSC was founded (1987), the organization was rededicated to the Lord. We placed our focus back on Jesus Christ, committing to honor Him. He has called us to feed his kids, and with his help we will keep reaching farther around the world until ALL are fed. Through God, FMSC will strive to eliminate malnutrition and starvation in children throughout the world by helping to instill compassion in a generation that hears and responds to the cries of those in need until all are fed. We believe there is one God in three persons: Father, Son and the Holy Spirit. He has directed us to help others in need. We believe The Gospel is the reason Feed My Starving Children exists. We strive to listen for and follow the will of Jesus Christ every day in all we do. We believe that partnering with other faith based and humanitarian organizations maximizes our ability to feed God’s children and enables our partners to provide more sustainable community development. FMSC's obedience to Christ and commitment to Christian principles will guide and direct our organization in fundraising, packaging and distributing food to those in need. We encourage people of all beliefs to volunteer with us to help us accomplish our mission. We will ensure our food ingredients are of the highest nutritional value to meet the needs of starving children. We will package our food through the use of volunteers to feed their spirit. We will partner with other humanitarian organizations to ensure safe transit and distribution of our food. We will distribute nutritious food to starving children throughout the world who are hungry in body and spirit. We will pray for the successful delivery of our food and for the physical and spiritual nourishment of its recipients. We commit to supporting long-term feeding programs which help ensure the continued growth of the children who receive our food. We will promote public trust of our organization through efficient, cost-effective and compassionate stewardship of our resources. We will provide for our employees a satisfying work environment that honors Christ and seeks to exemplify the Christian principles of love, compassion, humility, servant-leadership and accountability. Prayer plays an important part of FMSC. We pray over every meal. We believe prayer protects our food. We invite volunteers to pray over the food they’ve packed. 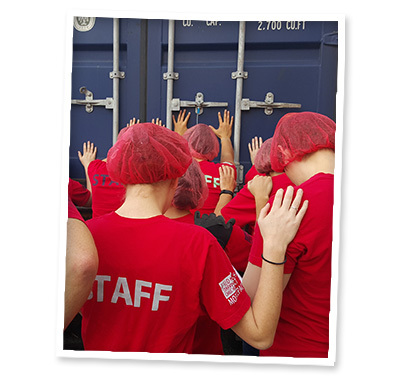 FMSC staff gathers to pray for each loaded container before it leaves our dock doors. By God’s grace more than 99% of all meals have arrived safely at their intended destination. While we’re firmly Christ-centered, we welcome people of all faiths (and none) to pack, fund and eat FMSC meals! Our partner organizations distribute the food unconditionally. We work well with secular businesses and public schools. We create an environment where everyone will feel comfortable volunteering. Through our actions, we strive to help people around the world encounter the love of God. "For I was hungry and you gave me something to eat." YOU Helped FMSC Reach a Milestone!